Beautiful and ornate. The best hotel in mandawa. No doubt. 1. Hotel is located in historical buildings with furniture and equipment, which were interesting at the first sight. 2. Reception was nice and staff helpfull. 3. Beautiful garden, puppet show, wellness possibilities were very nice. 4. Bed available for driver. This hotel exceeded our expectations. The hotel itself was absolutely beautiful and the room was gorgeous with a beautiful door and patio. The rooftop had a stunning view of the town and fort and was a great place to sit. The location was ideal as it wasn't far from the town market. The staff were really friendly too. The service and hospitality were extremely good staff was so helpful. The room was very nice clean and big. We took dinner and breakfast it was too delicious and fantastic. Town of Haveli nice place to visit. Quite and relaxing place. I recommend this Haveli Heritage Mandawa. To stay *****. Service was good and The staff is very friendly and the location is great. The breakfast was simple but good and we were upgraded for free to a very nice room. over all is value for money. The location was extremely good and we were in an amazing building with affresco everywhere. Very suggestive! Seemed to be sort of a phony haveli. i mean, it was fine. a bit too over-painted for my taste. not quite sure why we are meant to be so enchanted by havelis. though i complain about the buffets below, the dinners are quite good -- though too expensive. The Heritage Mandawa-A Luxury Hotel This rating is a reflection of how the property compares to the industry standard when it comes to price, facilities and services available. It's based on a self-evaluation by the property. Use this rating to help choose your stay! Rich in Rajasthani culture, Hotel Heritage Mandawa features ethnic Indian architecture and wall paintings throughout the property and guestrooms. Located in Mandawa, it is within a 15-minute walk from Mandawa Haveli, Raghunath Temple and Chhatri Building. Spacious and well-decorated, the air-conditioned rooms all come with a TV, fridge and telephone. Private bathrooms have a shower and free toiletries. Hotel Heritage Mandawa is 9.3 mi from Mukund Garh Railway Station and 17 mi from Junjhunu Railway Station. Jaipur Airport is 115 mi away. Camel rides, folk dance performances and guided Haveli tours are regularly arranged for guests. The hotel also includes packed lunches and a tour guide for all day trips. Rasila Restaurant serves traditional Rajasthani cuisine. Drinks can be enjoyed at the bar. Alternatively, room service is also available. When would you like to stay at The Heritage Mandawa-A Luxury Hotel? 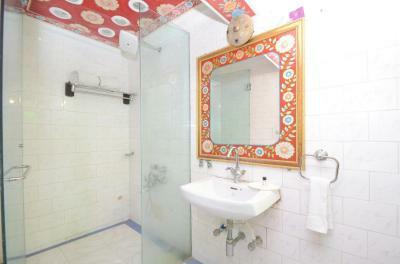 Richly decorated in an Indian ethnic style, this air-conditioned room comes with a TV, fridge and telephone. Private bathroom has a shower and free toiletries. This quadruple room is spacious and fully air conditioned. It comes with a TV, fridge and telephone. The private bathroom has a shower and free toiletries. House Rules The Heritage Mandawa-A Luxury Hotel takes special requests – add in the next step! The Heritage Mandawa-A Luxury Hotel accepts these cards and reserves the right to temporarily hold an amount prior to arrival. WiFi not available in room. The Havely is awesome ! Nice pool. Great room with period furniture. Food must have been made tastier Linens and blankets should have been clean. Staff be made courteous. Nothing.... this was a lovely place to visit. Unfortunately the staff was not as satisfactory as I thought. They feel the urge to get your money immediately not even waiting for you to be done with your meal (I stay overnight, I can't run away. KEEP IN MIND YOU CANNOT PAY WITH CREDIT CARD, so be aware or that and be prepared with paper money! Wifi is TERRIBLE. they have a signal NAMED Hotel Heritage Mandawa, but it does not work at all. they give you access to someone's d-link which goes in and out all the time. all the meals are buffet. and the breakfast is disgusting.